As a quintessential element of sprawl, the cul-de-sac has become a predictable target for critique and attack. Loved by suburbanites for its presumed safety, privacy, and even exclusivity, the cul-de-sac has been blamed, deservingly, for many of the ills of sprawl: disconnected street networks, over-loading of suburban thoroughfares, lack of walkable block structure, residual open space, only a single building type and only a single use, to name a few. Prevalent within single-family subdivisions, of which we have hundreds of thousands in the US, the cul-de-sac has become in the past 60 years one of the most widely spread planning patterns around the world. Of all the types of sprawl patterns, residential subdivisions (where cul-de-sacs proliferate) are the most difficult to change, for many reasons. One is that they consist of multiple properties. Another is that the single-family houses are usually the biggest investment of the homeowners, who might be afraid of any change. NIMBYism (ironically itself the result of sprawl) is another obstacle. Homeowners associations and their restrictions are often the most powerful impediments to sprawl repair. How can cul-de-sacs be redeemed? Can they be transformed into something more useful than dead-end patches of asphalt? Can we “occupy” them in more meaningful ways? It is realistic to assume that even if we had the most assertive intentions to transform cul-de-sacs into benevolent urban patterns we would not be able to change all of them any time soon. There are simply too many, with people living around them, most of whom will be resistant to change. But the most innovative (and transformative) intervention is to create new centers of activity. Single-family subdivisions are not complete, self-sustaining entities: they lack the most elementary daily services such as corner stores, drycleaners and places for gathering and socializing. The idea is to insert a Complete-the-Neighborhood Module, a “package” of buildings and uses that will rebalance the sprawling residential enclaves by adding some of the missing elements. An expandable, flexible grouping of structures can be made to fit within and between existing houses or replace abandoned or outdated housing stock to provide much-needed amenities. The posted example, developed with Chris Ritter and watercolored by Eusebio Azcue at DPZ, shows the incremental replacement of three houses with new structures. First, the house on the left is replaced by a flex building – a recycling/learning center that can include a workshop and market where people can build or repair and then sell such things as furniture, appliances, and electronics. A recycling drop-off station and compactors for plastic and aluminum are in the back; a greenhouse is attached on one side, with a compost drop-off spot behind it. The house on the right is replaced by a cooking school and a small restaurant that can be used as a banquet room by the residents and seniors. A dry cleaner, hairdresser or a small daycare can occupy the middle portion that joins the two structures. The new buildings face the street and form an attached plaza that can later be replicated on the other side of the entrance street. The plaza can be used for outdoor eating and games for the elderly. The parking is hidden behind but conveniently accessible from two sides, and a path connects it to the cul-de-sac. The next step is the replacement of the third house by six live-work units with an average footprint of 1,000 square feet or less. They represent valuable real estate that could pay for the acquisition of the houses and the construction of the additional amenities. Senior housing is an alternative to the live-work units that could allow retired residents to remain in the neighborhood. This transformation is the beginning of a main street for the single-family subdivision. It may undergo further and more substantial changes if there is support from the residents. This technique can be applied not only to the cul-de-sac but in other places around a sprawling neighborhood in need of repair. 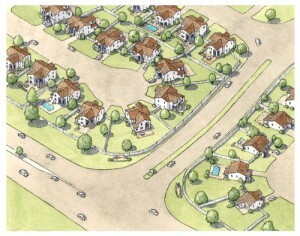 Similar ideas for the redevelopment of an entire single-family subdivision are illustrated in the Sprawl Repair Manual. Postscript: The time of reckoning for sprawl has arrived. Millions will be stuck in declining impoverished suburbs. Economic factors will make it difficult for some of the younger residents moving out and will prevent the seniors from getting rid of large homes and mortgages when they wish to retire. This will create an urgent need to change the current arrangement to bring more flexibility, adaptability, and enterprise to cul-de-sacs. The truth is that some subdivisions with fossilized governing documents will be frozen by inaction and will be left to wither and, instead of serving the growing needs of the population, will succumb to decay and irrelevance. Others will gather the collective strength needed to face reality and make changes that will benefit not only everyone around the cul-de-sac, but also the wider community. ← A Suburban Pilgrimage, Part II: Retrofitting Levittown!